It's been a while since I've written a health related post here but that's not to say I haven't been focusing on nurturing my health. In fact, quite the opposite. I've learnt this year that looking after my health needs to remain a priority, just as it was 4 years ago when my life was a lot more stressful. Healthy eating, moderate drinking, exercise and relaxation are as vital today as they were back then when I was at my most stressed. I've been researching how habits are formed in the hope that I can understand and improve how I react when life gets busy and stressful. So, how can we maintain healthy habits when the going gets tough? 1. 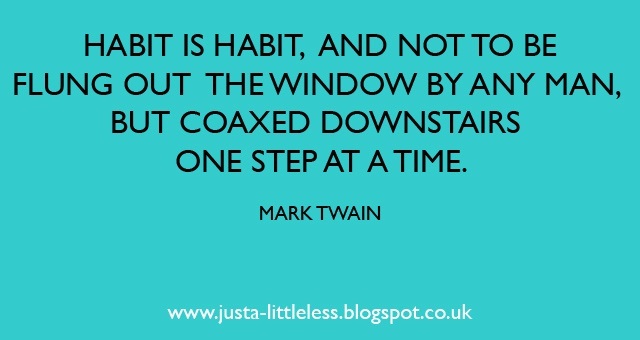 The first step is to be aware of your habits and how often you repeat them. Developing an awareness of how you react to different situations can be enlightening. You may want to keep a diary of what triggers a habit and what the outcome is. 2. The next step is to decide which habit you'd like to improve. Leo Babauta suggests working on one new habit a month and starting with small goals to ensure success. Even tiny improvements like one more glass of water a day are a step in the right direction. 3. Visual cues are important in forming new habits. Write a reminder of your new habit and display it where you'll see it every day. Display healthy items prominently in your home and remove or limit the unhealthy options. Put your running shoes by the front door as a visual clue for your morning run the next day. Verbal cues are important too. Try dancing or exercising to a favourite song when it comes on the radio. Isn't that Beyoncé's secret? 4. Focus on the reward. How does more exercise, a healthier diet or more time for relaxation affect your mood and sense of well-being? Remind yourself of how great you feel when you take better care of yourself. Build on this. 5. Talk positively to yourself. Stop those negative thoughts in their tracks. Big up your ability to improve your behaviour and you will be more likely to succeed. Your conscious mind instructs your subconscious mind. Positive talk builds positive action. 7. Share your healthy habits with friends and family. When your resolve weakens they may support you and help rekindle your motivation to make healthy choices. 8. Know that temptation will pass. Deal with temptation by substituting healthy alternatives. Swap the biscuits for a small piece of dark chocolate, a glass of wine for a soak in bubble bath, internet browsing for an early night. 9. Willpower varies so embrace balance. Allow for setbacks. Allow yourself treats but learn to limit them. A day off from exercise, the occasional sweet treat, or a glass of wine can lift your mood when done in moderation. Yes you will need willpower at the start to overcome a negative habit but eventually the new (positive) response will become automatic. Master that willpower that lurks within you. 10. Be a mindful shopper. If over buying is a habit limit the amount of times you shop. Making a purchase that you have researched, saved up for and planned will make you happier than when you buy items on impulse, out of boredom, unhappiness or feelings of inadequacy. Know that what goes in our shopping baskets is often an unconscious decision, even down to the brands we buy. Beware, most of the healthiest items come without fancy packaging. Believe in yourself. Don't worry how long it takes to develop new habits, just make healthy choices today. I know exactly what you are saying....same with me...the demands put on me by my family, sick elderly parents, overcommitting, and other unexpected demands gets me completely off track...unhealthy snacks , a quick take away because I'm too tired to cook....glass of wine after spending a whole day waiting around hospitals......it takes its toll, then I get back on board again with taking good care of myself...only to eventually fall down again....I guess that's life. I don't know why I go so off track when faced with these distractions. Will read your list carefully and try to apply them. thanks. I'm a great believer in mindfulness. Adopting positive strategies as you suggest is very good for modern life.